The Residence Collection has a fully branded showroom that’s not only there to support their growing network of trade partners, but is in fact a fully operational consumer environment which is used to support local installation companies in the Gloucestershire and the surrounding areas, 7 days a week. Dressed in British vintage styling and radiating period charm, the self-sufficient consumer showroom has independent access to the car park and is visible from the main A38. There are toilet facilities, a bar area with kitchen, seating and refreshments and an open plan meeting area with television for customer presentations. 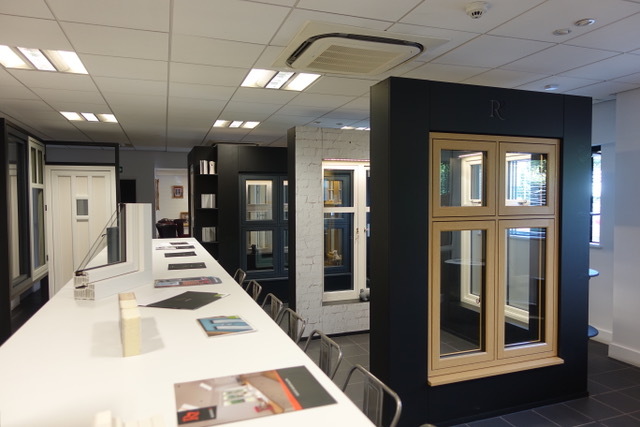 On display is the full range of marketing support materials including glossy brochures and a vast array of beautifully presented premium and super premium windows and doors from The Residence Collection. There are nine full sized windows showing R2, R7 and R9 including window combinations, Georgian bar and all three glazing beads for double glazing. In addition, there are also four full sized working doors including R9 Solidor, French, glazed open in and timber alternative with panelled sash and mullions to complement the windows. There are a wide variety of coloured and woodgrain options on show across the range including dual colours, along with further corner samples, bay and coupler assemblies. For further information for both retail and trade partner enquiries please call 01452 348650.